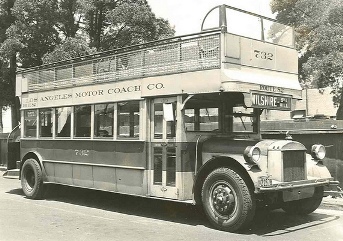 Our extensive coverage of the Westside Subway Extension and Bus Rapid Transit for Wilshire Boulevard this year provides us with an opportunity to revisit Wilshire of days gone by. The Metro Library Primary Resources blog highlights several items of interest from the past, including 1920s and ’30s double-decker bus service, holiday celebrations and historic images from the USC and UCLA digital libraries. There’s much to be discovered along one of L.A.’s most famous streets, so head on over to Primary Resources to learn more. I would love to see an updated version of these in Metro’s fleet, up and down Ventura Boulevard. Uh, we did have the updated versions. Is everyone on this site new to L.A. It’s as if y’all arrived last week. Back in the late 1970’s and early 1980’s, the SCRTD had a number of modern double-Decker buses. They were assigned almost exclusively to the Express eastern suburban routes via the El Monte Busway, mostly the old 490’s lines. I remember the Times article announcing the coming end of the SCRTD’s use of the sleek looking double-Deckers, stating that they would phase out those buses as they arrived damaged. “Our drivers seem to find every tree,” was the quote from one SCRTD official as to the reason to phase out those neat looking double-deckers. The cost seemed to outweigh its effectiveness. AND, late 1980’s or early 1990’s SCRTD/LACMTA has several Kneeling Buses, and the drivers used the Kneeling feature a lot–UNTIL–that kneeling feature was found to often FAIL and do so stuck in the Kneeling position, which meant that the bus could no longer safely proceed. There goes that great feature. AND, we have always been first with alternative fuels, so there was the huge investment in Ethanol with HUNDREDS of Ethanol buses purchased in an attempt to clean the air, only to find that the Ethanol was eating away at the engines. All those buses were dead weights. My point is that, contrary to a lot of the suggestions on this site, SCRTD and LACMTA have Been There; Done That, more than the vast majority of regulars on this site who have been in Los Angeles for a total of 2 hours and feel qualified to offer “NEW” suggestions for our moribound transit agency. Live and learn, people. Ask if LA has ever done one of your suggestions before thinking oneself an innovator or a “they have that where I come from. There are a lot more examples, but I’ll save those for later.